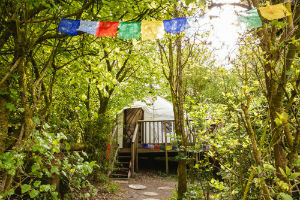 Our family run, award winning, glamping campsite, established in 2003, has spectacular views of the Welsh countryside and is located on the edge of woodland on a 20 acres small holding in west Wales. 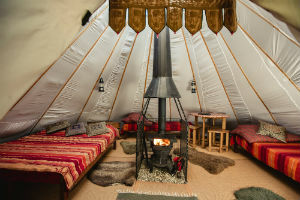 We offer five different nomadic ‘glamping’ experiences: an Alachigh, a Mongolian Ger, a Bentwood Yurt, a Lavvu and a Native American Tipi, each of which has its own ‘space’, separated by mature shrubs and trees, and all connected by hand-made stepping stones. 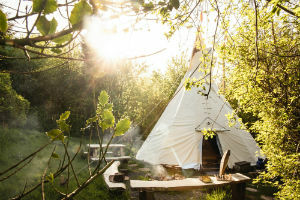 Spend your evenings relaxing next to a glowing campfire, looking at an endless sky of stars and waking to the sound of birdsong. 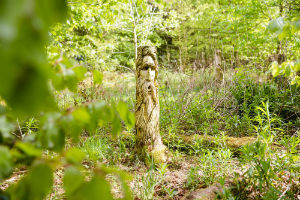 This is a quiet location, well away from busy roads and not far from both the Carmarthen Bay and the Cardigan Bay coastlines. 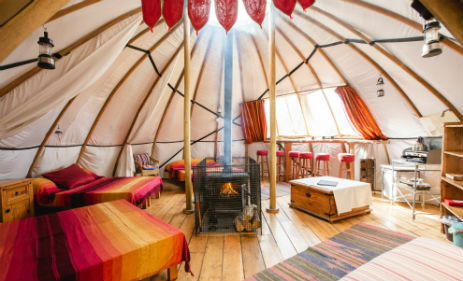 If you’re looking for a child-friendly, relaxed and sustainable alternative holiday, then you need look no further – a ‘glamping’ holiday in a beautiful location. 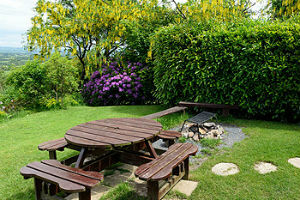 There’s no need to bring lots of things with you – we really do supply all the normal camping paraphernalia! 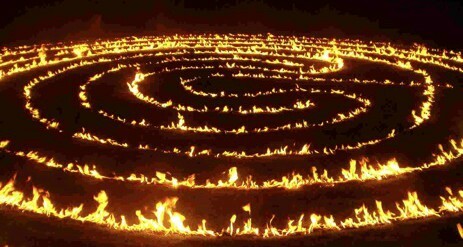 All you need to bring are sleeping bags, your own food, a towel and a torch. You can obviously bring whatever you want but we offer it anyway. 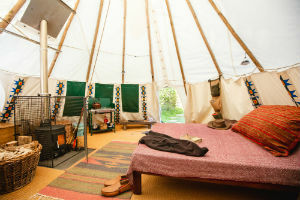 24′ in diameter the overall effect is a dome shape and in some ways its a cross between a yurt and a tipi. Comfortably sleeps six. 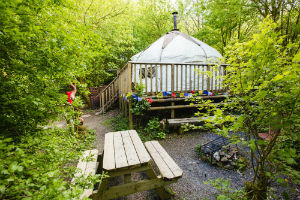 Outside there is a large picnic bench and a camp fire area, together with a trivet if you’d like to cook over an open fire and stunning views of the Welsh countryside. 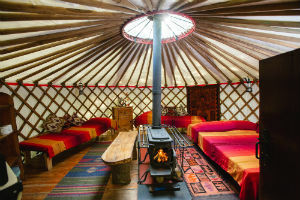 The Bentwood yurt has a wonderful sense of ‘space’. It has been built on a platform, giving it an elevation which allows a fine view. 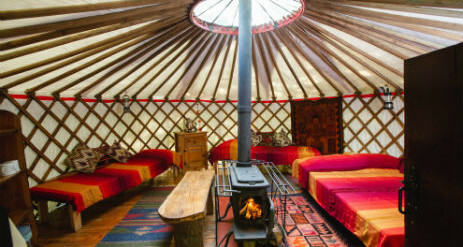 Sleeps 4. 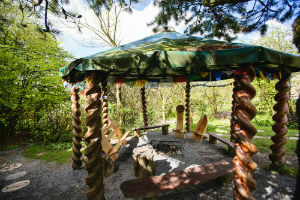 Outside the yurt there is a campfire area, wooden benches and a picnic bench. 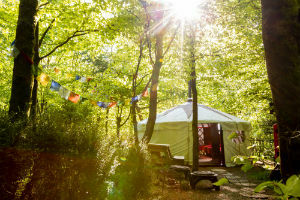 Set a little apart from the rest of the campsite, on the edge of four acres of established woodland and surrounded by beech trees, it’s the perfect retreat for a family holiday or a romantic break for two.Sleeps four. 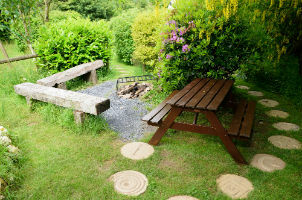 There is a picnic table outside of the ger together with an area for an outside camp fire, a trivet for cooking over an open fire, and a fantastic recycled tyre table and chair set. 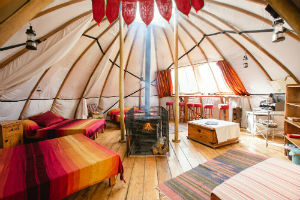 The tipi is a magnificent structure and provides accommodation for four people as well as being wonderful for a romantic break away for a couple. 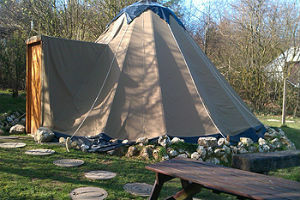 It is located at the end of the campsite and therefore relatively private. 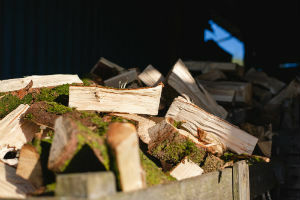 A ‘barrel’ woodstove will keep you wonderfully warm – with a fireguard to ensure that no little fingers get burnt! A wooden floor covered with Dandy Dura flooring, sheepskins and rugs. 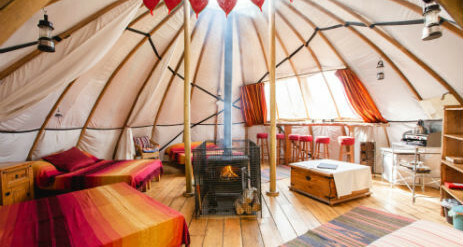 This is a lovely structure – a wonderful cross between a tipi and a yurt! Available for use by all our customers is a log cabin which has a full size calor gas cooker with an oven, a cast iron Victorian cooking range, a low energy power supply for mobile phones (mobile phone reception here is good), battery charging, etc, a sink for washing up, a central table and is also furnished with sheepskins, rugs and cushions. 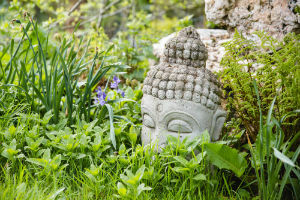 We have a good range of books covering all aspects of nature, from insects to trees and wild flowers, as well as books on the construction of tipis and yurts, nomadic structures and rustic retreats. 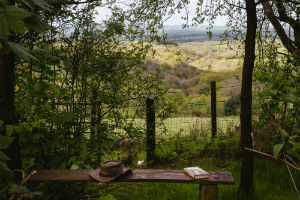 There are also books on walks in the area – in Carmarthenshire, Ceredigion and Pembrokeshire and a very good supply of flyers giving details of tourist attractions in the area. Recycling facilities are also available. We’ve also created our own ‘local trip advice!’ folder in which customers have given their own views on local attractions, beaches etc. All cooking equipment is supplied, i.e. 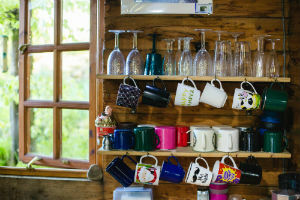 pots, pans, crockery, cutlery, etc… Because we’re ‘off grid’ we don’t have fridges for keeping food cool but we do supply you with a cool box and will replenish ice packs daily. 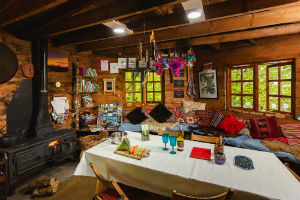 Meals are not included in the holiday but you can cook on an open fire (one basket of firewood included per day – any more than that is £3 a basket) outside all of the accommodation, on a barbeque or on calor gas. 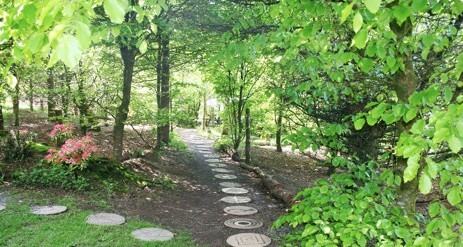 Or alternatively there are several good local restaurants – menus and directions available! 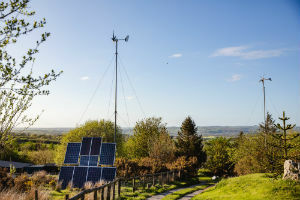 All you need to bring are sleeping bags, your own food, a towel for the shower and a torch, although there are solar lights around the campsite. 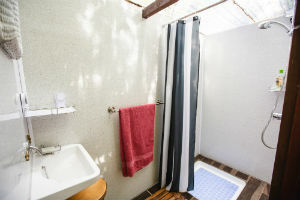 Also on site there are two hot showers, a tiled compost loo (praised by many of our guests!) and a bog standard flush loo! All cleaning products used are environmentally friendly, and we supply eco friendly shampoo, conditioner, soap and clothes washing product. 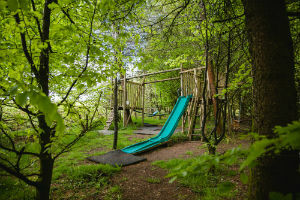 There is a play area for children located on the edge of woodland which has been much praised by parents and children alike! 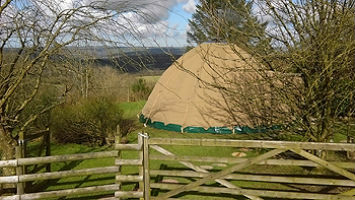 We are located in a very rural location not too far from the beautiful beaches of both Cardigan Bay, with its dolphins, porpoises and seals, and also Carmarthen Bay with its long sandy beaches. 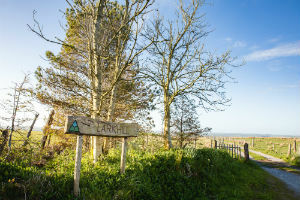 There is a multitude of things to do in the area – from the energetic – horse riding, canoeing, mountain bike riding and go-carting, to coastal walking, visiting an Iron Age fort, numerous gardens (including the National Botanical Garden), a gold mine, and castles (there are many in the area). If the weather isn’t kind the National Woollen Museum is on our doorstep as is a Childhood Museum and two steam railways. Fantastic! 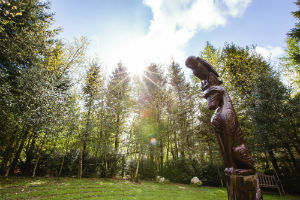 Brilliant stay, cosy, warm, everything good – even the weather. 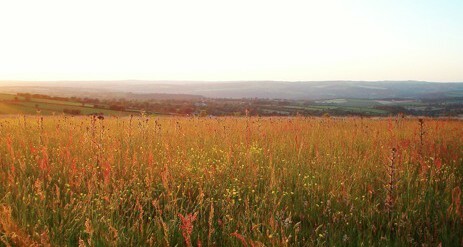 Hope to get here more often. Thank you both again for amazing welcomes and kindnesses. 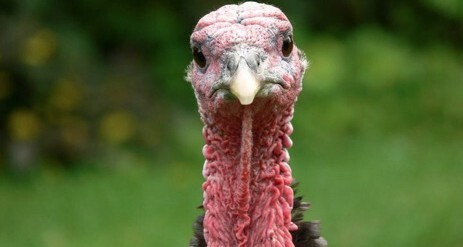 A lovely couple of days getting away from all the pre-Christmas bustle. Weather not great but always snug in the Ger. One word – AWESOME!